WALLA WALLA, Washington – The three-year general investigation study on the Mill Creek Flood Control is well underway. 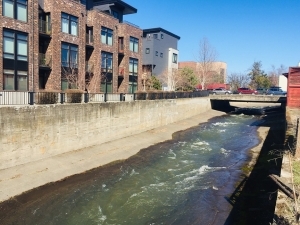 The U.S. Army Corps of Engineers-Walla Walla District is working in partnership with its non-federal sponsor, Walla Walla County, to analyze the overall flood risk Mill Creek poses to Walla Walla and surrounding communities. According to the USACE, the age and deterioration of the project’s system of levees, concrete channel and infrastructure located above or alongside the channel are of great concern to the community of Walla Walla. Designed in the 1930s, a flood in 1996 damaged the levee portions of the system and damaged part of the concrete channel. With all the talk about Mill Creek, Walla Walla County Board of Commissioner Chairman Todd Kimball said it’s that concrete channel that’s drawing a lot of interest. On Tuesday, a meeting was held at Walla Walla Community College with the USACE, the Mill Creek Coalition, Downtown Walla Walla Foundation, Port of Walla Walla, city of Walla Walla, Walla Walla County and the Confederated Tribes of the Umatilla Indian Reservation to review the preferred plan and what it will accomplish. With the some of the results coming in from the study, Kimball said the USACE is moving ahead of schedule. With the USACE about a year into the process, Kimball said there are already plans and options.